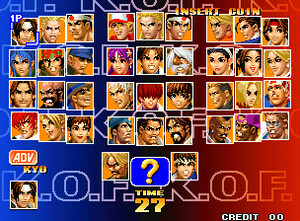 See the humor of each character: During the order select, you can see mental condition of your fighters by pressing START. Choose your winning Pose: After a victory, hold A, B, C, or D to choose a winning pose. Extra Survivor Mode: To play an alternate Survivor Mode, place the cursor on 'SURVIVOR MODE' in the main menu, then validate with A+C. Play Omega Rugal: Put the cursor on Rugal and hold START. You can now play the Boss of the game. Play EX characters: Some fighters can be played with their Kof 95' moves. Still by holding START, this tip works for the following characters: Terry, Andy, Joe, Ryo, Robert, Yuri, Kyo, Mai, Billy (these last two have their RB2 moves).